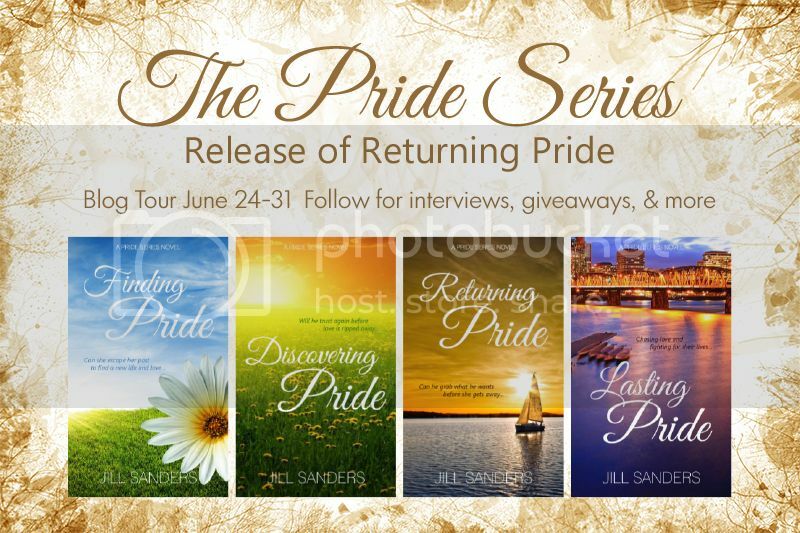 Today on the blog, I’m excited to welcome Jill M. Sanders, the author of The Pride Series. I’m a part of her wonderful blog tour to promote the third book in the series, Returning Pride. Iian Jordan runs a successful restaurant that has been in his family for generations, he has a large beautiful house that overlooks the shoreline and his wonderful hometown. Why then, does he feel like something is missing? And he isn’t talking about his hearing, which he’d lost in a tragic accident over ten years ago. No, what he is missing in his life, is the person who’d just driven back into town. Someone he’s always loved from afar. Now, he needs to step up and grab what he wants, before she gets away again. In the past two years, Allison Adams has made a name for herself in the art world. All she wants now is some peace and quiet from all the hassles and pressures of her demanding career. But, when she arrives home, she finds her mother trapped in an illness that consumes her every waking moment. Just when she thinks she knows the path she wants to follow, everything is taken away from her in one scary night. But, with the help of the good people in her hometown and an old flame, she might just find that returning home was the best thing that could have happened. Definitely pick up this book if you want to relax with a romance novel. There are two previous novels to the series, so you’ll have plenty to read! Jill Sanders survived 80’s pop music, and life as an identical twin in a chaotic family of nine. A feat by any standard! She was born and raised in the Pacific Northwest, relocating to Colorado for college and a successful IT career at IBM in Boulder. Jill is currently running a giveaway for Finding Pride and Discovering Pride on her blog. For your chance to win, click here.